Wallis Brozman has a form of dystonia, a generalized movement disorder that causes painful muscle contractions and abnormal involuntary spasms that can render her essentially paralyzed within minutes. Her dystonia has impacted the muscles around her vocal cords, limiting her voice to little more than a whisper. Wallis is fluent in American Sign Language and graduated from Gallaudet University, the only 4-year university serving the Deaf and hard of hearing. 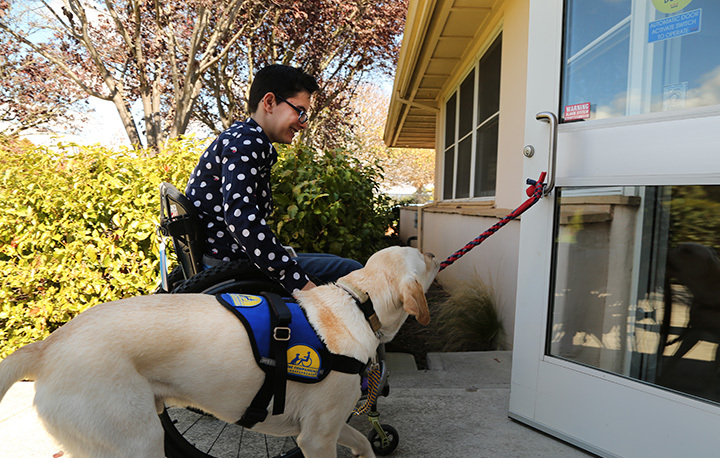 In 2009, Wallis received Service Dog Caspin from Canine Companions for Independence. Wallis taught Caspin over 55 commands in American Sign Language to further their communication. During many dystonic episodes, Caspin pulled Wallis safely home and stayed by her side, helping her independently manage attacks by becoming her hands, legs and a call for help. Together as a team, Wallis and Caspin participated in dozens of media and outreach appearances from local demonstrations, national news segments and two international National Geographic shows.